We are in the throws of winter where I live....okay honestly as I type this it feels more like Spring and there is grass showing which is not normal! I am sure Mother Nature will bless us with more snow so I decided to play with a flower this month. To me, nothing says warm weather and sunshine like flowers. 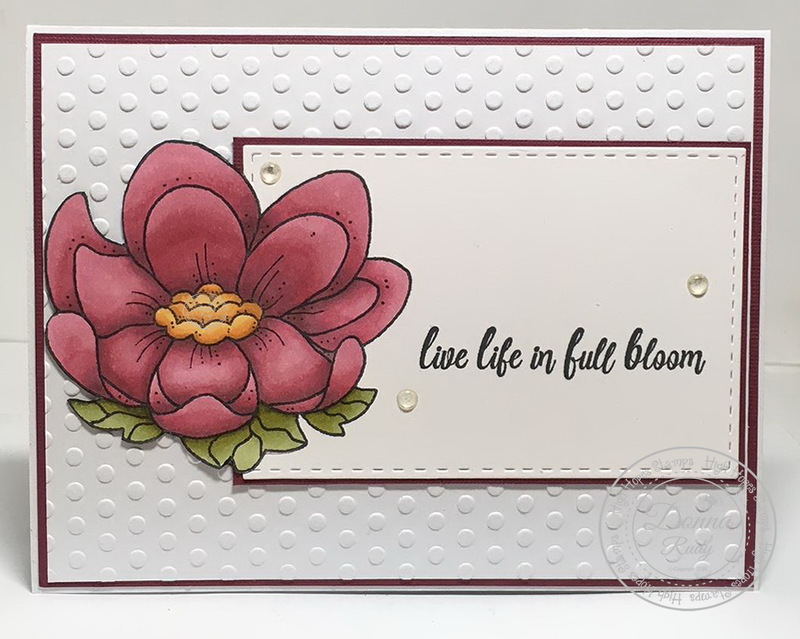 I chose to make a CAS (clean and simple) card with the "Large Open Flower stamp from High Hopes Rubber Stamps. CAS style cards are not in my comfort zone and I found myself literally sitting on my hands to keep from adding things. I coloured "Large Open Flower" with alcohol markers. Then I took a deep breath and partially fussy cut only part of the image. I slipped a stitched rectangle die behind it and ran it through my Big Kick. I had set the sentiment on before hand to make sure that everything would fit properly before die cutting my rectangle. My Misti was the perfect tool to place my sentiment exactly where I wanted it and voila! 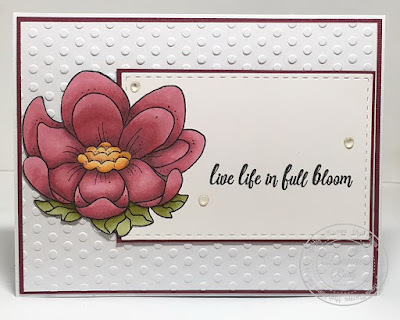 I added all of this to a white background with embossed polka dots. A few clear gumdrops which I felt looked like dew drops finish off my card. We hope you will join us for our Anything Goes Challenge. We can't wait to see your creations! Lovely card , yep , didn’t need one more thing. This card is gorgeous! I LOVE the CAS design and so glad you sat on your hands LOL, it's perfect!! 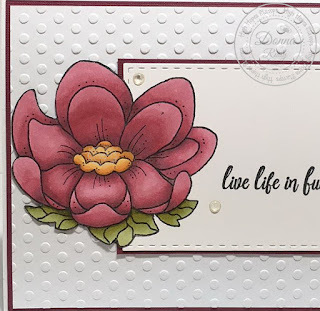 A gorgeous card Donna! The CAS design makes it look very elegant. So glad you could sit on your hands.